Our fancy coupling - Public Forum - Kedron Owners Group Inc. Very pretty ,don’t you think! The hitch is a D 045 and the tow bar is 4.5 tonnes. The shackles are are so big they have trouble fitting into the 20mm hole of the tow bar. I reckon we could pull a Sherman out of a bog. (probably even if it had one track missing). One thing for sure the Ford & the Kedron will never part no matter what(unless I choose of course). I do like your coupling and I will do the same. Where did you purchase the bits and pieces? I was under the impression that the chains had to be welded to the van chassis. 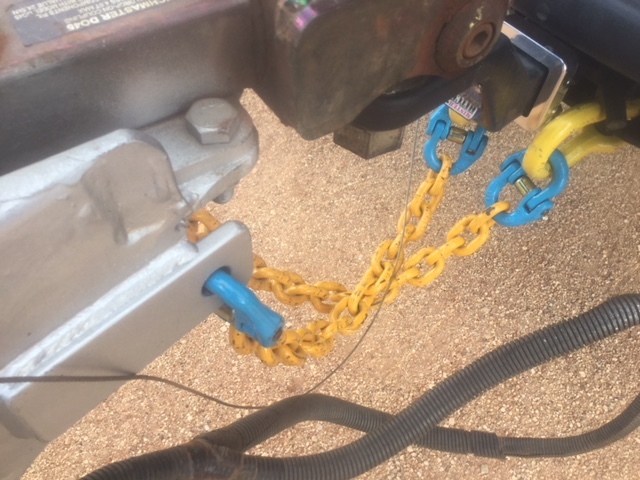 Hi tensile/high sheer load chain used in a GVM upgrade CANNOT be welded as it weakens/lowers the chains ratings. The chain on your van is probably welded on your draw bar (as was mine). The std welded chain is only good enough up to 3500kg's. Have a read of the post 'GVM upgrades' on this forum. A good place for all the required bits & pieces is Couplemate in Brisbane.